Used extensively for the first time on Allied aircraft during D-Day, invasion stripes have also been used post World War 2 during both the Korean War and Suez Crisis of 1956. This article explains the background to these stripes and why they were implemented and some of the air forces that have used them. During 1942 there was pressure for a second front to be opened to help take the pressure off the Soviet Union on the Eastern Front. Whilst unable to launch a full scale invasion the go ahead was given on the 4th April 1942 for plans to be drawn up for a raid on Dieppe in Northern France. With so many aircraft involved, and the expected Luftwaffe response, the need for quick identification would be crucial. 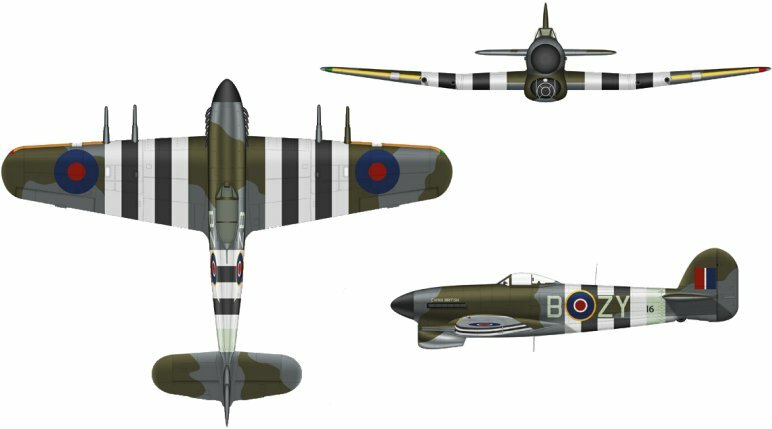 This would see the Supermarine Spitfires taking part painted with white stripes on the front of the aircraft to just before the cockpit and on the tail fin. 'Operation Rutter', as it was known, was scheduled to take place on the 7th July 1942, but with a Luftwaffe bombing raid taking place shortly before this date on the raiding force the element of surprise was lost. The following month on the 19th August and now known as 'Operation Jubilee' the Dieppe raid took place, however the white stripes on the Spitfires were not used. Starting on the 9th July 1943 Operation Husky, the Allied invasion of Sicily, began. As part of the invasion force 144 Douglas Dakotas carry paratroopers flew in at just 400 feet over the invasion fleet and beaches, who were briefed that this airborne drop was happening. On the ground the American forces had been coming under sustained attacks from the air and as the Dakotas past overhead the first two formations made successful drops. Tragedy would then strike as one gunner opened fire on the aircraft, this would have the unfortunate consequence of all shore troops and offshore ships also opening fire on the aircraft. The aftermath of this was 23 Dakotas shot down with 37 damaged, 83 people died whilst 318 were injured. This was to be the worst 'friendly fire' event suffered by the United States during World War 2. With the invasion of Europe planned for June next year a solution was needed to avoid a repeat incident. One solution considered to solve the problem of identifying friendly or enemy aircraft was already fitted to a large number of aircraft, this was the friend or foe (IFF) transponder. This would be a non-starter, as due to the sheer amount of aircraft that would take part in the invasion the system would be unable to cope. In the end the solution used would be low tech. The idea used was to paint black and white stripes on the aircraft. This wasn't a completely new idea as when the Hawker Typhoon and certain Hawker Tempest Mks entered service they resembled the Focke-Wulf Fw 190 when viewed from certain angles leading to a few 'friendly fire' incidents. This would see black and white stripes being painted under the wings only. 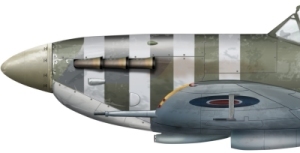 This would be expanded on for D-Day and in the memorandum issued by the Supreme Headquarters Allied Expeditionary Force on the 18th April 1944 it stated that Allied aircraft would have five stripes on both wings and on the rear fuselage without covering national markings, as seen on the Hawker Typhoon image below. There were some exceptions for example such as most of the four-engined heavy bombers used by the Allies as the chance of misidentification was low as the Luftwaffe had very few four engined aircraft. The size of the invasion stripes were to vary according to aircraft size. Single engined aircraft would have stripes 18 inches wide whilst twin-engine aircraft would have 24 inch wide stripes. Night fighters, four engined bombers and sea planes wouldn't need to have the stripes added. Whilst a few tactical reconnaissance aircraft which were operating at low level were excused from painting the stripes on the top of the wing. The idea was simple and allowed gunners to make quick decisions on whether the aircraft flying over was friend or foe. The go ahead for the idea was given on the 17th May 1944 by the Commander of the Allied Expeditionary Air Force, Air Chief Marshall Sir Trafford Leigh-Mallory. However the order to paint the stripes would not be given just yet. This was so the Luftwaffe would be unaware of the idea and paint them on their own aircraft. To test whether the stripes added to the aircraft would work and to allow gunners on the ships to see what they looked like, on the 1st June 1944 a few painted aircraft flew over the fleet involved in the invasion of France. With D-Day due to begin on the 5th June, but delayed in the end until the 6th, security around the idea was tight, it wouldn't be until the 3rd June that the order to paint troop carriers was given whilst other aircraft got their orders the following day. When D-Day occurred a total of 14,574 sorties would be carried out by the Allies and with the Luftwaffe's lack of presence over the invasion beaches and ships as well as the invasion stripes played a part in cutting down 'friendly fire' instances, however 127 aircraft were lost to a number of causes. As the invasion progressed and airfields in France established the stripes on the upper parts of the aircraft were ordered to be removed a month after D-Day. Eventually as the Allies progressed eastwards they would be removed from all aircraft before 1944 was over. The use of invasion stripes as a means of identification wasn't limited to the Allies nor were the colours black and white. Jagdverband 44, which was formed in February 1945, were a Luftwaffe squadron who used the Messerschmitt Me 262 jet fighter which were vulnerable to attack during take-off and landing so the unit formed the Platzschutzstaffel (airfield protection squadron) using Fw 190Ds, painted red with white stripes on the underneath of the aircraft, to protect the Me 262 during these phases. The Swiss Air Force would also adopt what were termed 'neutrality bands' as due to its location in the heart of German occupied Europe incursion by both Allied and Axis aircraft was inevitable. If it was just a single aircraft the Swiss Air Force would seek to intercept and force the aircraft to land and intern the crews. However as they were operating the Messerschmitt Bf 109 misidentification would occur and one such incident on the 5th September 1944 would have tragic consequences when a North American P-51 Mustang of the United States Army Air Force encountered a Swiss Air Force Bf 109 and shot it down, killing the pilot. This would lead to red and white neutrality bands added to aircraft operated by the Swiss Air Force soon after. The Korean War would see the black and white invasion stripes re-appear mainly on aircraft operating with the Fleet Air Arm and Australian Fleet Air Arm. In the early phase of the war American 4th Fighter Interception Wing F-86 Sabres would also be painted with the stripes. Further use of invasion stripes would occur during the Suez Crisis of 1956. This would see the colours changed to 3 yellow and 2 black stripes on the side of the fuselage and either underneath or on top of the wings. The size of the stripes for single-engined aircraft would be 12 inches whilst for other aircraft it would be 24 inches. These would appear on Royal Air Force, Fleet Air Arm, French Air Force, French Naval Aviation and Israeli Air Force aircraft.